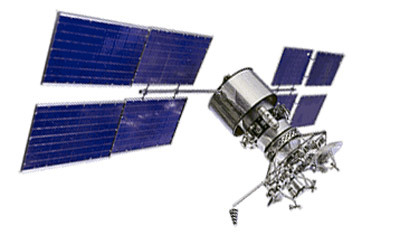 The Ekspress series spacecraft for Data transmission, TV & radio-broadcasting, communications, Internet, video-conference closely resembled the Gals spacecraft and shared a similar spacecraft bus. Ekspress was to replace the widely used Gorizont spacecraft, and plans called for deployments at 13 locations (40 degrees, 53 degrees, 80 degrees, 90 degrees, 96.5 degrees, 99 degrees, 103 degrees, 140 degrees, 145 degrees, 205 degrees, 322.5 degrees, 346 degrees, and 349 degrees, all East longitude) for domestic needs and to support the Intersputnik Telecommunications Association. Additional Ekspress spacecraft were to be sold to foreign companies, e.g., Rimsat, Ltd, but these deals did not materialize. While the Express solar arrays were identical to those on Gals, the spacecraft bus had slightly smaller dimensions of 3.6 m by 6.1 m. A typical Ekspress payload included 10 C-band and 2 Ku-band transponders. Ekspress 1 reached its checkout location of 70 degrees E at the end of October 1994 and was scheduled to be moved to 14 degrees W shortly after the start of 1995. Only one other of the basic Ekspress series was launched.